Bill Rauscher has compiled a volume with hundreds of verses written by more than 100 authors featuring magic and magicians in both serious, humorous, lighthearted poems and limericks. This attractive book is a pleasing, refreshing, serious, funny and touching anthology for the magic fraternity. In the book are many photos and illustrations and the poems are complimented by introductions and commentary. You are are invited to enter the magic minds of such notables as Theo Bamberg, Silent Mora, Dan Waldron, Herman Weber, Frances Willard, Dorny, Micky Hades, Karrell Fox, Willard Smith, Harry Opel, Rudy Vida, Saram Ellison, Lance Pierce, Henry R. Evans, MarcoM, Houdini and many others. I read the book from cover to cover. It is a marvelous monument to the poets of various levels in our art. It will certainly stand out as one of the most unique books in the libraries of magicians - not to mention, one of the most entertaining. It is like a box of rich chocolates. You have to select and savor the contents in small increments. Another unusual book by my friend William V. Rauscher. 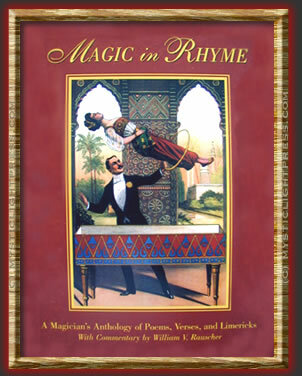 This oversized 250 page soft cover contains a huge number of poems, verses, and limericks on magic subjects. Many of these have been mined from impossible to find magazines like Mahatma and the Sphinx, as well as older issues of Genii and various other publications. If you're fond of magical verse, you'll want this book. A bargain at $25.00. I had not anticipated that this book would be so large and multifaceted. It combs the literature of wizardry. Names like Albert Bigelow Paine and Edgar Guest rose nostalgically; verses dedicated to Doug Henning, Thurston and Houdini mingled with plebian doggerel; the sophisticated gracefulness of Karl Germain..on went the contents and my delighted reading. This is not a shallow "See Jane Run" type of book. No, this is a profoundly entertaining look at the sub-culture of magicians and their idiosyncrasies, flirtation with power and humorous take on this dimension...A carload of interesting illustrations and eye catching cover we return to simpler times before terrorism and cynicism. I was amazed at the number of magi who write in verse. The fun thing about Magic in Rhyme is that it can be read when all else is quiet and you can jump around the book. A wonderful and clever book, and I am so happy to say it is taking a place of honor in my magic den. You'll enjoy these odes to Magic, be amazed and fascinated by some of the authors, and have an interesting and conversation-starting coffee table book. The book is a much finer specimen of verse and publishing than I expected! ..I found a further bonus than the verse itself: the insights it gives to the magic historian. Reading the poems dealing with the shows of great magicians of the past, I fround revelations of what their shows must have been like, and how they were regarded by their contemporaries...I think the book is an invaluable reference for anyone attempting authoritative writing on these people...I feel honored to be included in the book and glad to be in such company. You have compiled a fabulous collection. What a treasure for the Magic community.